There is strong historical evidence that Baptists are unique among the non-Catholic faith traditions. Just as Baptists are unique in Church history, what we believe is also distinctive from other denominations. Technically, there is no Baptist "denomination." Denominations are centrally governed, and Baptist churches are autonomous. Even Baptist affiliations, fellowships, and associations, like the Southern Baptist Convention (SBC), which says of itself that it is the largest "Protestant denomination," are not truly denominations in the same sense that the Presbyterians, Methodists, and Lutherans are. These unique doctrines and principles, though shared by other evangelicals, are often referred to as "The Baptist Distinctives." The main reason I have written this series of sermons on the Baptist Distinctives is that many Baptists have lost sight of their roots, and even many Baptist pastors have failed to see the relevance of this rich heritage. 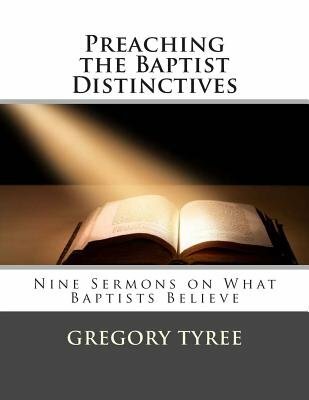 Therefore, I hope that pastors and teachers will find this to be a good resource to help them reinforce or reintroduce the Baptist Distinctives to their congregations. A book based on this series, titled What Baptists Believe, is forthcoming, and is written with the Baptist layperson in mind. It is my prayer that these sermons will be a blessing to you and your congregation. Please use them for the glory of God. May God bless you as you "preach the Word "